Back in 1837 a company formed called the Swansea Waterworks Company. They were given parliamentary powers to construct a reservoir at Brynmill to supply the needs of the locality. When constructed the capacity of the reservoir was 5,500,000 gallons fed from the Brynmill Stream and other sources. However, the reservoir was situated at too low a level to supply more than the lowest parts and levels of the town. Indeed it only managed its supply intermittently and at insufficient pressure. Cholera outbreaks in 1832 and 1849 in Swansea emphasised the need for better water supplies in the town in terms of both quality and quantity. In 1852 the local Boards of Health obtained the sanction of the then General Board of Health to purchase the Swansea Works Company and its Brynmill Reservoir for a sum of £25,250. The area soon ceased to be a water supply for the City and in 1871 the land surrounding the reservoir came under Swansea Corporation control. Since the land had been informally used for picnicking since the 1840’s it was then developed as a formal park with the initial phases of construction taking place in the 1870’s. It soon became Swansea's first informal park. 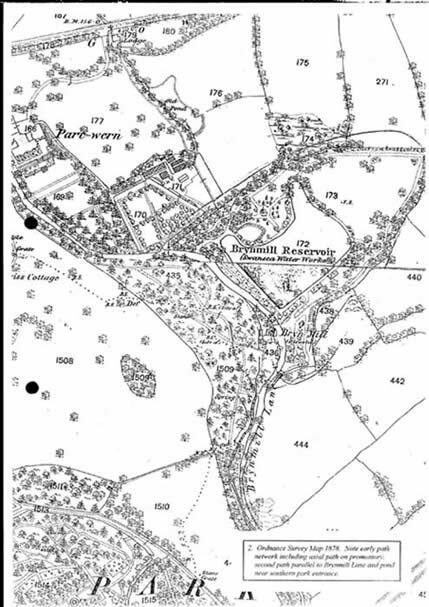 By 1913 the area had been officially named Brynmill Park. The park has survived many changes over the years including the introduction a public glasshouse menagerie with a variety of animals from monkeys to guinea pigs and birds from parakeets to golden pheasants. Originating from 1913, the aviaries had been a popular attraction for people from across the city. The remnants of the reservoir were used for fishing and in the 1950’s there was a large rowing boat that took the paying public on trips around the lake. In the late 1990’s the glasshouse was removed along with the remaining bird and animal cages. The large stock of course fish within the lake have been transferred to other lakes within Swansea and the fishing permits have been stopped on the lake. The reduction of the fish population will allow the introduction of aquatic plants in and around the lake. 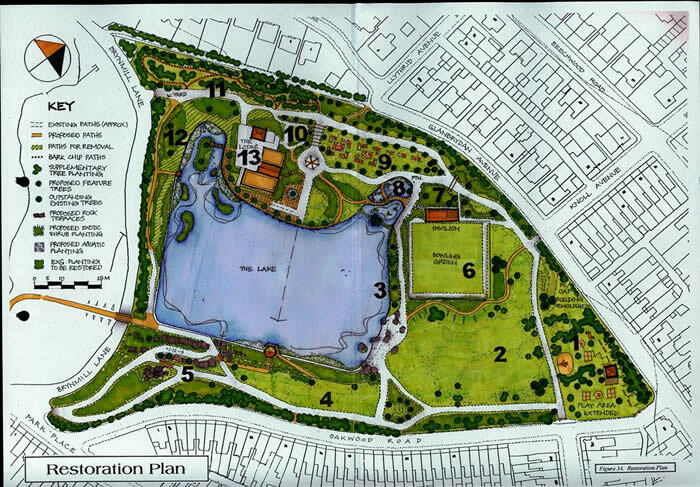 In 2000, representatives of the Heritage Lottery Fund and CADW visited Swansea parks and advised that, of all the parks, Brynmill Park should be the primary candidate for a submission to the Heritage Lottery Fund’s Public Parks Initiative. In a separate development the aviaries at Brynmill Park were closed due to concerns over animal welfare. In 2006, The Heritage Lottery Fund awarded a grant for the restoration of Brynmill Park and work started on the refurbishment of the park in 2007. This development included the new Discovery Centre which now provides the park with a focus for exploring its history and wildlife. The large one way glass window enables visitors to view birds in their natural habitat without disturbing them. The Centre is not only and educational facility for interpreting the different habitats within the park, but also provides a base for local organisations and community in which it is situated. During the refurbishment of the park, volunteers from Swansea University have made valuable contributions to the redevelopment of the lake and the introduction of nesting areas for birds. They have constructed the floating Island you can see in the centre of the lake and helped plant the marginal plants around the edges. The park will continue to need volunteers to help with a variety of projects and all are welcome. The Bowling Green was the first in Swansea. It dates from c.1907 and is as popular today as when it first opened. The two clubs, Brynmill and St Gabriels, both celebrated their centenaries in 2007. The new play area is very popular with families all over Swansea. The Nest Swing is one of the most favoured items of equipment and is suitable for use by Children of all abilities, the play area is for children up to the age of 7.